Photograph courtesy Roger Geach Class 52 No.1052 & Class 25 No.25094 inside Laira depot on September 21st 1975. Within a month 25094 will be transferred to Haymarket. 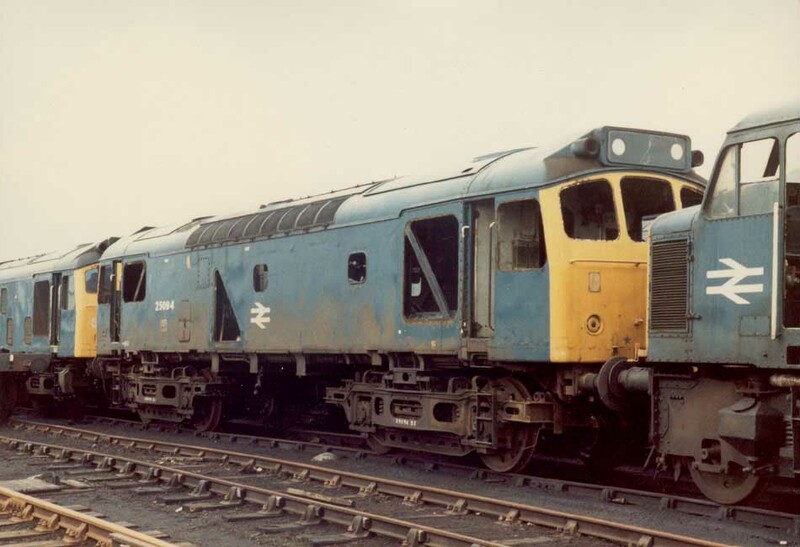 With a multitude of transfers in its seventeen year career, D5244/25094 was one of the most transferred Class 25s, with allocations to London Midland, Southern, Scottish and Western Region depots. January 1965 to London Division Midland Lines (LMML). October 1974 to Spring Branch. March 1975 to Springs Branch. 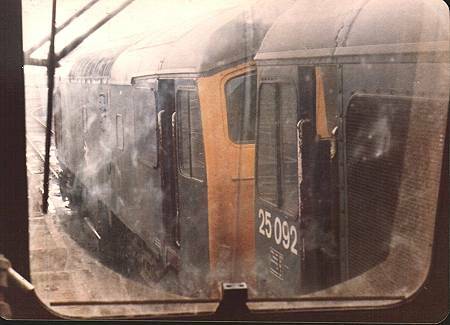 25094 was the 89th Class 25 withdrawn, one of twelve retired during February 1981. After withdrawal 25094 was stored at Etches Park, then noted at Derby Works by April 1981 and scrapped there by June 1982. Noted Crewe Works November 1965. Presumed repair Glasgow Works 1976/1977 (not before September 1976). The frames for D5294 were laid down at Derby Works during the last quarter of 1963, being completed and delivered to Toton (16A) during January 1964. 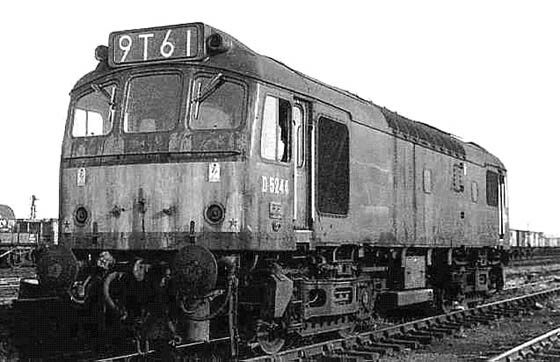 On January 3rd 1964 D5244 made its test run to Corby. The Southern Region experienced a number of problems with some of their electric locomotives, with many temporarily sidelined awaiting attention. This created a shortage of locomotives leading to D5240 - D5245 & D5247 moving to Hither Green (73C) during September. Despite this somewhat unusual transfer there are no reports of how the locomotives were used or any photographs of them during their brief stay south of the Thames. D5244 returned to Toton (16A) during November. Condition March: two-tone green livery with small yellow warning panels, straight sided sandboxes, three-rung bogie mounted footsteps. A begrimed D5244 is seen here in pretty much original condition, apart from the dirt. The washing of the cab windows has created a somewhat streaky mottled effect on the cab front. Photographer not known. On July 11th the 07.55 Walsall - Yarmouth was worked to Norwich by 5244 & 5232. 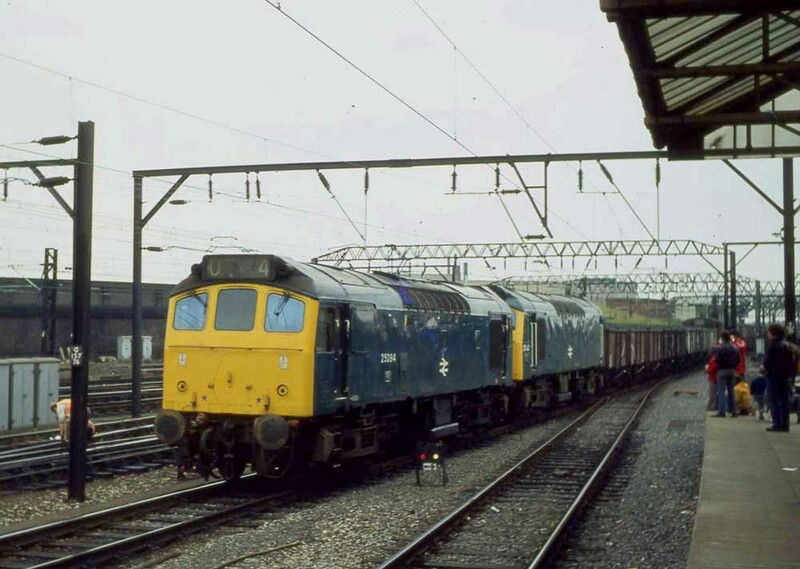 On August 4th a Derby - Skegness roundtrip was worked by 5244 & 7508. The Derby - Norwich - Yarmouth - Norwich - Walsall diagram was worked by 5244 & 5236 on June 10th. 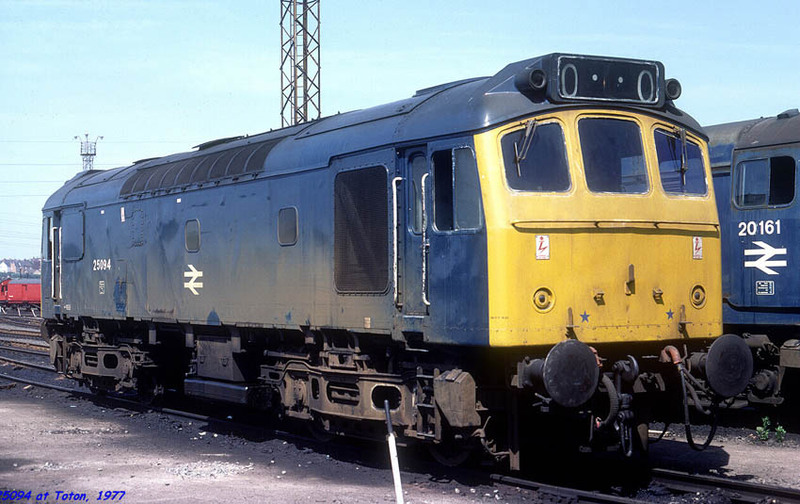 Photograph courtesy Steve Jones / Old Buffers On a gloriously sunny day in 1977 25094 stands at Toton. During 1977 25094 was allocated to Toton, Kingmoor & Crewe. On August 19th the summer dated roundtrip Nottingham - Llandudno Town was worked by 25094 between Chester & Llandudno Town having replaced 25317 and between Llandudno Town & Stoke-on-Trent on the return leg, being replaced by 25136. The 13.30 Manchester Victoria - Llandudno Town was worked by 25094 on September 9th. Photograph courtesy John Powell A familiar scene at Crewe as 25094 and a relatively ex-works 25133 head north through the station with a mixed freight on August 23rd 1978. On August 9th 25094 worked the 17.10 Cardiff - Crewe and a week later on August 16th worked the 13.20 Holyhead - Crewe relief. 25094 & 25056 worked to Hither Green with October 16th’s 11.45 ex Brent returning with the 10.57 Shepherdswell – Cricklewood. A lengthy trip on August 7th saw 25094 work the relief 11.30 Paignton - Wolverhampton throughout. The next day (8th) the 13.34 Birmingham New Street - York and the return 17.26 York - Birmingham New Street were worked by 25094 & 25071. The following day (9th) the same pair worked the 08.02 Walsall - Yarmouth to Norwich, returning from there with the 14.15 Yarmouth - Derby. 25094 was withdrawn on February 1st 1981. 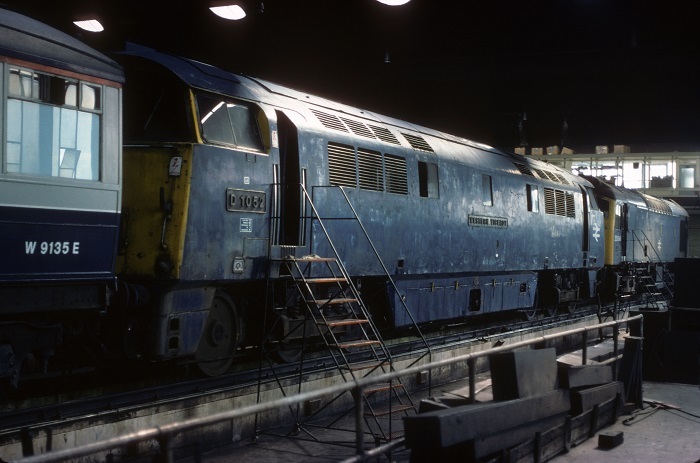 Photograph courtesy Jerry Glover A stripped out 25094 awaits scrapping at Derby Works, seen here on February 6th 1982. Last updated March 28th 2019.